Dutch epic pagan black metallers Uuntar have signed to Heidens Hart Records and will release their first chapter, “Voorvaderverering” on March 20th on CD and digitally. 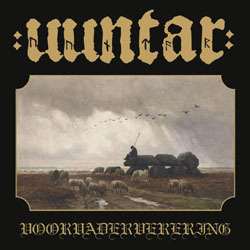 Uuntar is a project by two Dutch black metal veterans; Herjann (Heimdalls Wacht, Cultus, ex-Countess, ex-Mordaehoth) and Nortfalke (Kjeld, Lugubre, Tarnkappe). “Voorvaderverering” (Dutch for “ancestral worship”) was recorded in 2010, but not released until now. The duo recorded the six-song effort as a humble dedication to warriors and their traditions long gone. It is a nostalgic retrospect on old values and customs, in particular focusing around burial rites, dolmens and grave mounds in the north-east of The Netherlands. The album was self-produced by the band, so expect an unpolished sound that captures the cold winter atmosphere and characteristic smell from the forests of Grouninga, Tuianti and Threant. “Voorvaderverering” is already available for pre-order in their label’s official Bandcamp page. Expect epic and melodic pagan black metal; battle music for the fallen kings of the past, primordial music in the classic Scandinavian riff-based tradition, recorded in a primitive way and written with a focus on bombastic and majestic melodies, completed with ancient historical lyrics and writings.